I met Jude Mandell – author, poet, teacher, singer (she’s a woman after my own heart, with the many, many hats that she wears) – peeking from behind her book Amazing Faces at the SCBWI booksale. She had to peek because I think she barely cleared five feet tall, but she had the energy of three excited children bound up in that small frame. And I say her book, even though Amazing Faces is a collection of poems edited by Lee Bennett Hopkins and illustrated by Chris Soentpiet, and only one poem is Mandell’s – but her fervor for the book was impressive. I recognized the cover because Lee and Low had sent the book to me to review (thank you Lee and Low!). Jude’s poem is typical of the wonderfully emotional poems that fill this beautiful book. In simple but powerful language and life-like illustrations, Amazing Faces captures children’s faces and the emotions they wear on them as they play, pout, laugh, and sleep. The 16 poems come from esteemed children’s writers such as Jane Yolen and amazing poets like Langston Hughes. In reading Hughes poem, My People, I flashed back to Ashley Bryan leading a sing and response reading at the SCBWI conference. There is power in those words! Lee and Low is a small publisher that focuses on “stories that children of color can identify with and that all children can enjoy.” Amazing faces certainly meets that charter and moves hearts as well. I don’t usually review picture books on Ink Spells, but I think art draws all levels of readers into books, and poetry can be particularly demanding on readers, and thus ideally suited for advanced readers. 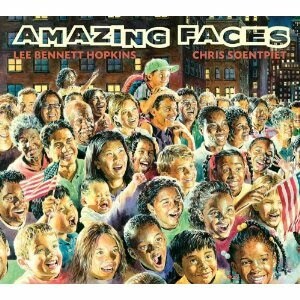 I heartily recommend Amazing Faces to move hearts of all ages. What picture books have moved your heart? I wish I could share more of the illustrations in this beautiful book, but you’ll have to just buy it, or win it! I will give away my copy of Amazing Faces at the end of the week – just make a comment any time this week to be entered in the drawing! Art Appreciation Week will continue all week with interviews and discussions of art. Please check out the Blog Roll of Honor on the side –> to visit some and support some of the artists who will be visiting Ink Spells this week! I love this imagistic poetry. I'd love to win the book. It sounds wonderful. Someday I'll get all the books read that I've won, including yours! Just have to get my book revisions done (sigh). In a few more weeks, I hope….!!! That book sounds wonderful, so even if I don't win it, I'll be making sure I buy it for my nieces chldren. Thanks for a great review. should be posted in every school in the USA. heartfelt responses to AMAZING FACES. Very cool! And man, Ashley Bryan reading that Langston Hughes poem was really something special. @Ann Good luck with the revisions! @Catherine Yay! I'm sure your nieces will love it. @Liz Hi! Thanks for stopping by! That sounds like a great book, and the poems you showed as examples are incredible–simple and raw and amazing. I'll keep a look out for it! I love simple poems. Sometimes the more simple the more powerful! @Lydia Having that kind of punch in just a few words always impresses me! What a beautiful cover. There are so many talented illustrators out there. The books should say author and artist instead of author and illustrator. OH it sounds amazing! Little known fact about me – I am also a poet. I've written some children's poetry and published online only. But, as a consequence I LOVE it. I especially enjoyed Ashley Bryan at the conference. I wish I could bottle his enthusiasm. @Teresa Author and Artist has a great ring to it! @Lisa Congrats on your online publication! That is very cool. And Ashley Bryan pretty much enthralled me. Thanks for this terrific INK SPELLS review of AMAZING FACES–and your generous response to me/my poem about bullying/ostracism, "I'm the One.' To have my poem illustrated by the gifted brush of the astounding Chris Soentpiet–well, words would fail me–if I wasn't a writer. And working with master-anthologist Lee Bennett Hopkins is a reward in itself. So great meeting you @ SCBWI LA. Love your blog! I'll be checking in often. This is beautiful poetry. Simple, but powerful and to self indulgent as it can sometimes be. What a wonderful review! When my children were younger, I loved reading books of poetry out loud to them. Love the review and the cover. Thanks for this terrific INK SPELLS review of AMAZING FACES–and your generous response to my poem about bullying/ostracism, "I'm the One.' To have my poem illustrated by the gifted brush of the astounding Chris Soentpiet–well, words would fail me–if I wasn't a writer.And working with master-anthologist Lee Bennett Hopkins was a reward in itself. So great meeting you @ SCBWI LA. Love your blog! I'll be checking in often.